Unknown to many, landscape lighting has more benefits than just giving accents to beautiful landscape spots. Different lights must be combined correctly and must be placed strategically to give that beautiful effect. And it takes an experienced, skilled, and talented team like Rainbow Acres Landscaping to do that. Landscape is a beautiful work of art that has to be showed off all the time. However, the beautiful scene in your outdoor wanes as the sun goes down. But it will not happen if there is landscape lighting. Outdoor lighting will take charge of the show at night. The beautiful combination of shadows, accents, and silhouettes will surely create a magical and mystifying effect that can never be possible at daytime. Not only beauty, landscape lighting is also helpful for safety and security. The light is enough to deter burglars, intruders, and even annoying animals. Lights will also help your guests to safely wander around the landscape. They will illuminate outdoor areas for safe yet private time with friends and family. Lights also make the outdoors more functional and livable at night. Decks will be more attractive. Patios will be ideal for a warm gathering. Gazebos will provide a nice place for a good chat with guests. With enough landscape lights, porch swing, garden bridge, fountains, waterfalls, and the pool can finally be used even at night. With these so many benefits of landscape lightings, they have now become one of the most essential elements of outdoor living spaces. Every residential or commercial space in Vermont should definitely have wisely installed landscape lights for beauty, safety, and function. Outdoor lighting comes in different forms and they were made for different functions. Path lights are enough to illuminate entry doors, driveways, walkways and other pathways. If you need a brighter light, then get a few flood lights. They are like the mini version of spot lights. Install them at least nine feet from the ground and they can light up dark stairs, garages, and entryways. Flood lights are perfect to scare away intruders and for giving a safe access to your house at night. Path lights and flood lights are perfect for safety and security. They can also accentuate the landscape but they’re not as decorative as the outdoor lighting made for that purpose. Wall lights illuminate a beautiful work of art on the wall. Post lighting may be similar to the flood light. But they are more stylish and are often seen on the sidewalks. On the walkways, you’ll frequently see the walkway lights. They are almost similar to the path lights, only that they are mounted on a post and come in lovelier designs. Deck lights aren’t hung from a post but are mounted into the stairs, railings, and benches. Spot lights and well lights are special landscape lighting used to highlight beautiful flowers, shrubs, and trees. All these outdoor lighting types are available in various designs and they can get energy from different sources like the sun. 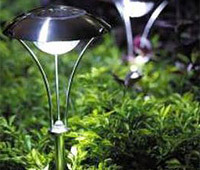 Solar-powered lights are quite popular and more functional. Low voltage landscape lightings are also available today. Are you ready to provide a mystifying shine to your outdoors with landscape lighting? Call Rainbow Acres Landscaping today and we’ll help you build the most beautiful landscape in Vermont at night.